There is a wide range of rooms and suites at Annabelle to suit every need and taste. Bedrooms are styled with a minimalist, Mediterranean-chic décor, and bathrooms are elegantly appointed in marble tiling. Many of the rooms and suites are interconnecting, perfect for families. We recommend opting for a sea view rather than the inland view to really make the most of the setting. Ease into elegance with one of these generous 47 entry-level rooms, each sleeping two. Every Inland View Room is complete with artisan furniture, cooling marble floors, and classical marble bathroom. Relax on your balcony with views towards historic Paphos or across Annabelle’s lush grounds. 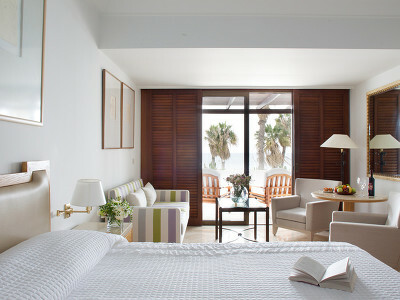 These 81 spacious rooms, suitable for up to three, have been thoughtfully designed with the sea in mind. Each room features cool marble flooring that bare feet will love and step-out balconies from which to savour the changing colours of the Mediterranean. An additional cot or child's bed is available upon request. These 18 ground floor rooms, suitable for up to three, enjoy restful views out to the Mediterranean and the beautifully designed pool gardens. Enticing terraces with wooden loungers invite relaxation, while classical interiors feature locally crafted furniture and traditional marble flooring. An additional cot or child's bed is available upon request. Infused with light and colonial appeal, these 20 airy rooms, each sleeping up to three, open onto roomy balconies to soak up views of the ever-changing ocean in privacy and comfort. 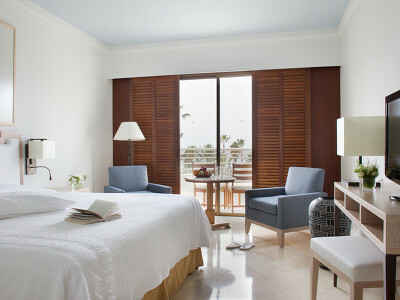 Bedrooms have comfortable furnishings crafted by Cypriot artisans plus elegant bathrooms with walk-in showers. An additional cot or child's bed is available upon request. The bright and airy Studio Suites are located on the 1st floor of Annabelle and overlook the Mediterranean and Paphos harbour . Each of the 10 suites sleeps a maximum of three and features an open-plan bedroom and living room with bespoke furniture, as well as beautiful light-flooded marble bathrooms. An additional cot or child's bed is available upon request. Sitting within six acres of lush Mediterranean gardens on the seafront of Paphos, Cyprus, Annabelle is a luxurious hotel with great service and excellent dining options. Run by the same family team behind Almyra and Anassa, Annabelle displays the same level of sophistication and quality as her sister properties. A stay at Annabelle is all about kicking back and relaxing in the beautiful Cypriot sunshine; find a spot in the lush tropical garden, or take a dip in the free-form cascading pool. The sleekly modern rooftop pool and spa area provides an elegant pampering sanctuary. Within easy reach of some of the best beaches on the island as well as the archaeological sites of Paphos, Annabelle is perfect for exploring Cyprus, and the team can arrange excursions for you to experience everything that the island has to offer. After a day spent exploring, relax on the rooftop cocktail bar for stunning sunsets before enjoying a meal at one of Annabelle’s excellent eateries. We were founded forty years ago by my father, the late Alecos Michaelides. Each of our three hotels is much-loved and entirely distinctive in their own way - Annabelle evokes the classic Mediterranean charm of blue seas, warm stone, and rustic, yet chic design. My favourite spot is Ouranos, our rooftop bar and restaurant. Ouranos means sky in Greek, which is the right word to describe it - while standing there you feel you are up in the sky! The seafront gardens, pool setting and outstanding dining experiences at Annabelle mean that you may want to just stay 'at home', unwind and soak up the sun. The tropical gardens have a chic pergola and wooden terrace - the perfect spot to kick back with a real page-turner; alternatively, relax in one of the hotel’s three pools. Choose from the meandering free-form pool complete with enchanting cascades, or the ultra-modern rooftop indoor pool, with its panoramic views over the bay. The rooftop pool area is also home to a sleek wellness centre offering a range of pampering treatments and massages. A wide variety of kid-friendly activities and clubs will mean that you can find some peace while the little ones are taken care of. 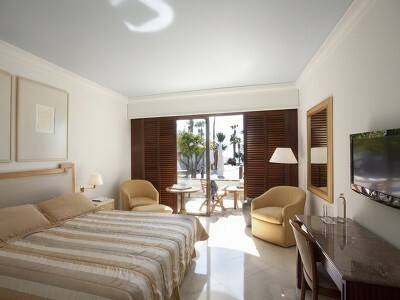 The hotel is perfectly placed to explore the culture of Cyprus. If you’ve been inspired by the hotel’s restaurants to bring a bit of Cypriot cuisine home with you, book one of the hotel’s cookery or bread-making classes. History buffs will want to make time to visit the extraordinary archaeological remains at Paphos, home to a royal necropolis dating back to the 4th century. The hotel can arrange excursions along the island’s coast. Just 20 minutes east of Annabelle there is an idyllic bay where, legend has it, Aphrodite was born from the sea. Whoever swims around Aphrodite's rock there will find true love. Take a boat out and visit the nearby islands and crystal coves. Cape Arnaoutis is on the tip of the Akamas peninsula and is well worth a visit; far from the tourist trail and with pretty sheltered bays, this is a great spot for a picnic. Guests at Annabelle can choose from a wide range of restaurants and bars, showcasing traditional Cypriot dishes, local tipples and live music every night of the week. Asteras is for the romantic guests, who can dine at candlelit tables overlooking the shimmering water gardens. During the warmer months book a table on the terrace for dinner under the stars. For a fine dining experience head to Amorosa where sophisticated French dishes are served to the sound of a classical pianist. For a relaxed beach-chic lunch or dinner Mediterraneo is the place to be; fresh fish, healthy salads or chargrilled shashlik can be savoured with a glass of chilled wine. The contemporary Ouranos bar is situated on the hotel’s rooftop, and serves a fresh Mediterranean cuisine of salads and grilled fish, enjoyed while gazing at the panoramic vista of the surrounding bay. Breakfast is taken by the half-olympic-size pool at the Fontana restaurant where a variety of themed nights are held during the summer months. Start off your evening with a glass of champagne at the Byz Bar or sip on a smoothie at the swim up bar. Annabelle is a 19-minute drive (approximately 16.2km distance) from Paphos International Airport. A variety of transfer and shuttle services are available from the airport. Room rates include 9% VAT and 10% service charge and daily buffet breakfast. Municipality Levy: €1.06 (€0.97+VAT) per day per adult is not included and will be charged locally at the hotel. Excellent hotel and service. Very close to Phaphos harbour. Good food. Main drawback is that beds are very firm even with 2 extra mattress toppers. Cannot say enough good things about how great the staff are here. Hotel is absolutely fantastic but it was the staff, especially in the dining room, that made our stay so extra special. Thanks to all. I pop in for a quick beer, I was really made welcome so had another. Fantastic service. I'll be popping back in before I go home.